Greg is a sensitive, creative, Earth-conscious spirit by nature. When he found Yoga, it was like coming home. Greg spent years traveling and teaching worldwide; he has taught over 9,000 public classes, leads international workshops, trainings, and maintains a devoted self practice and commitment to personal inquiry and growth. Rooted in Classical Hatha, and influenced by many styles and beloved gurus; his classes are fun, focused, and very naturally flowing; lightheartedly exploring and embracing our shared humanness. Don't be surprised if you find yourself in a "cirque du soliel" pose one minute, then busting over in ridiculous group laughter or a blissful a singalong the next! Greg brings Pranayama, Meditation, and group intention into each class providing a truly balanced, grounded and holistic experience. He is also a seasoned and passionate musician and Kirtanist, and has led group Kirtan for years. 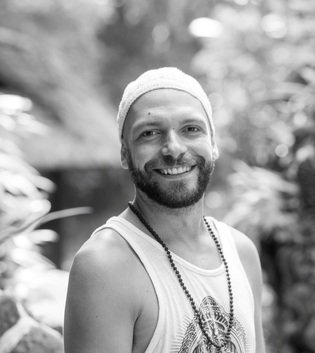 With 1800 Hours of Yoga Alliance certified training, Greg is studied in a wide variety of Yoga styles, including: Hatha, Vinyasa, Kundalini, Power, Hot, Meditation, Pranayama, Restorative, Tibetan Heart, Yin, Yoga Nidra & Kirtan. Greg's current life philosophy: "Life is a Divine Leela (play); Let's embrace our differences, support each other through the challenges, learn how to laugh at ourselves, and have gratitude for the gift of life around us."